Total Welding Supply is a distributor of high quality Welding, Positioning and Thermal Cutting equipment. We also supply Industrial and Specialty Gases in the Massachusetts, Rhode Island and Connecticut markets. Total Welding Supply carries industrial & specialty gases. We also offer cylinder rental and welding machine repair services. Industrial, medical, specialty, cryogenic, & compressed gases. 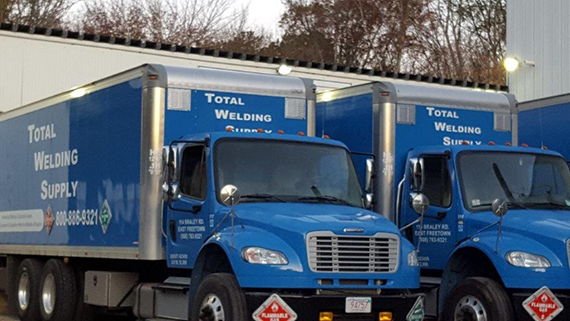 Located in Freetown and Brockton Massachusetts, Total Welding Supply is unique in creating innovative solutions for our customers Welding and Gas needs. With over 70 years combined experience, our Sales Team can provide solutions for your problems and provide Cost Savings for your company’s bottom line. Our goal at Total Welding Supply is to expand on our reputation as a market leader in offering the most current technology, competitive prices and continually exceeding our customers’ expectations.